To recap the instructions on Day 5, the next two to three days will determine how much of the benefit you retain. Once again, eat slowly and chew your food well. Don't overeat. Start small and build to normal portions over the next three days. Now that you have had your final morning drink, oil is not a problem. You can also start having flax oil or flax seed again if you want. Any salad combination is okay (organic if possible). Homemade olive oil dressings work best. Avoid dressings containing dairy. As much as possible, avoid commercial dressings made with refined vegetable oils. Use lettuce, spinach, kale, and sprouts of all kinds. Add avocados, zucchini, onion, artichoke hearts, palm hearts, shredded carrots or beets, mandarin oranges, raisins, or dried cranberries. Fresh fruit salad works too. Over the next few weeks, this is the time to think about rebuilding your body after such an intense detox. For example, you just spent 5 days killing every type of virus, pathogen, fungi, and bacterium in your body. After detoxing, probiotics, digestive enzymes, and proteolytic enzymes are pretty much Jon's sine qua non of health. If you do these regularly along with proper eating, periodic juice fasting, liver detoxing, and exercise, your health is going to be pretty darn good. At one time, Jon Barron used to consider a broad-based vitamin/mineral supplement the cornerstone of the Baseline of Health Program. Nowadays, he personally uses more Digestive Enzymes than any other single supplement. He says that if he had one single supplement to take, it would probably be digestive enzymes with every meal. It may no longer be number one on his list, but a broad-based vitamin/mineral supplement is still a major component of the program. He recommends you find one you like and use it regularly along with daily trace minerals. A good Probiotic Formula is essential to keep beneficial bacteria populations at optimum levels. Jon says that the more he uses proteolytic enzymes, the more attached he's become to their benefits. He now considers them essential for optimum health. Superfood powder should become a regular part of your diet -- if not daily, at least 2-3 times a week. Find a good product and either mix it in juice, or blend it in fruit smoothies. Water soluble fiber in the form of freshly ground golden flaxseed, psyllium seed husks, or chia seeds should be used to supplement most diets. If you eat any grains or moderately high glycemic carbohydrates, you definitely want to be using a fiber based metabolic sugar enhancer to block receptor sites and slow the glycemic response. 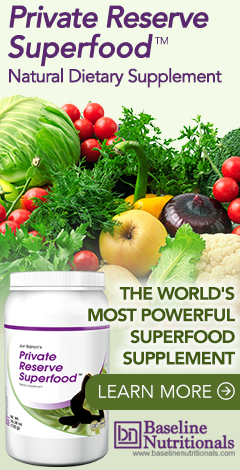 A full-spectrum antioxidant is essential to control free radical damage, prevent disease, slow down the degradation of organs such as your eyes, and extend life. The best sources of Omega-3 fatty acids are fish oil, krill oil, and high lignan cold-pressed, organic flax oil. Each has features that make it unique and invaluable. Use all three for a total of 3 grams worth each day. Vitamin D deficiency is emerging as a major source of age related conditions. 1000-2000 IU a day of D3 is not too much -- particularly if you don't spend much time in the sun. And even if you spend time in the sun, it's still worth supplementing -- particularly as you get older. Despite the odd (flawed) dissenting study, numerous studies have shown that high quality vitamin E supplementation promotes health. Make sure you use a full spectrum E that emphasizes gamma E and all of the tocotrienols. L-carnosine is an expensive supplement, but Jon swears it's also one of the reasons he doesn't look his age. Dosage is age-related. Jon uses 1500 mg a day in combination with DMAE and Acetyl-l-carnitine as found in his formula. For cardiovascular health, Jon suggests using ubiquinol CoQ10 at 50 mg a day. Jon rotates through immune boosters such as Echinacea, AHCC, and colostrum. He also uses pathogen destroyers semi-regularly (a couple of times a week) and on an as needed basis. Jon also swears by brain enhancing herbs such as bacopa monnieri. They definitely improve short term concentration and maximize the outlook for long term cognitive function. P.S. If you would like to share your detox experiences, feel free to send us your testimonial. We would be grateful for your comments and feedback as we expand the self-guided detox program. Do you feel any different now? Did you lose any weight? Did you notice any change in your eyesight or sense of taste or smell? Did you notice anything unusual in your stools? Do you feel lighter, cleaner, sharper? What ups and downs did you experience? And doesn't all of that holiday eating now seem like a distant memory? Thanks again for all your support. As Jon likes to say, "Good Health and Long Life" to you all. PS: And remember to eat carefully for the next few days to maximize the benefits of the detox! This is my third "Barron" detox, and my sixth total. It does get easier each time. I'm 73 years old, female. This time I had mild stomach cramps on the first and last days. Fortunately I had cleared my schedule and could curl up with a hot water bottle and a good novel. No problem. I still find assembling/ cleaning my Breville Fountain juicer because I am not mechanically inclined and live alone. It doesn't get easier. I've decided to give up juicing wheatgrass (best for energy) and kale (best for non-hunger) because they're too difficult to juice. Sometimes it works and sometimes it doesn't. The last day was yesterday. Today I don't feel any different from when I started, perhaps because my diet had been good before (doing Perlmutter's "Grain Brain." I lost only two pounds even though I stuck religiously to the detox protocol. The only solid foods I ate were bean sprouts, and not much of them. Those two lost pounds will probably return when I get solid food into my gut again. A hint for others: it's essential to do the detox in the SPRING, not winter, for several reasons. 1) Motivation is higher then with spring energy; 2) One can walk and sit in the sun, which helps with hunger; 3) spring ginger root is easy to peel and doesn't have those gritty fibers; 4) Chinese medicine says spring is when you should fast (says my acupuncturist). I have a question about the blood cleanser product. Have any studies been done to see whether it prevents cancer? I know such a study would be hard to do. Warm weather is certainly a good time to do a detox. But Jon recommends 4 detoxes a year—2 intestinal along with heavy metal detox and 2 kidney/liver/gallbladder along with a blood cleanse. Given that program, you’re going to have to detox in the fall and winter also. The Breville Fountain is a great juicer, but better to use a lesser juicer that you find easier to clean and assemble. In other words, a lesser juicer that you use is far superior to a better juicer that you don’t use. As for the blood cleanser, there have been no studies on the complete formula, only on the individual ingredients. Something to keep in mind is that if the complete formula were tested and proven to the FDA’s satisfaction, it could no longer be sold over the counter. It would then be considered a drug and require a doctor’s prescription. This is my first time doing these cleanses, and I was very thankful to have found them after googling "heavy metal cleanse." I believe that I have a rare blood disorder called Essential Thrombocythemia, and I wanted to see if after doing these cleanses, the disorder slows down or stops advancing, but I won't know until my next blood test next month. The thing that was the most strange about the liver/blood cleanse was on day 2, I passed a red rope looking thing that made me think it could have been a parasite. Day 3 of the cleanse, I felt my gall bladder dumping out, and saw a large amount of green sludge with some stones also. I give myself enemas regularly for chronic constipation, so I know what it feels like when the gall bladder is dumping out. I was surprised at how much sludge was in my GB since I do regular enemas. Thank you Jon and staff for your book and all the information you freely give out. It is very helpful, and gives me hope. Thank you for letting us know your results! Glad it has helped you! I use all your supplements & even persuaded Aggressive Health in the UK to stock them. And guess what people are buying them ..a lot. I have done a 3rd liver & gall bladder cleanse. This was even easier than the first two. Thank you so very much for putting this incredibly valueable information on the Net for everyone's benefit. Love your company & all the articles. Thank you, that is great to hear!